As we reach the halfway point in our countdown, let me say a few quick words about D’Angelo. As you’ve hopefully heard, he released his long-awaited second album Black Messiah a couple of weeks ago, during a time when many in the music world had already released their Top Albums of 2014 lists, or at the very least were on the verge of doing so. The Top 50 Albums list that we’re counting down right now was actually all locked in during the first week of December. Really it’s just the writing that’s holding up everything being published in a more immediate fashion. So like those other music media outlets, I’m officially ruling that Black Messiah missed the unofficial cut off date and will not be found on this list. If you’ll recall, a similar thing happened with Beyonce last year, as her self-titled album came out a couple of weeks before Christmas. That turned out to be one of the best albums of 2013, to the point where I almost felt it’d be reasonable to include it on this year’s list since it missed out last year. Actually that D’Angelo record is one of 2014’s best as well, which also makes its lack of representation here just a touch sad. So I’ll advocate for it right now. Please check it out and pick up a copy. Of course I’ll also recommend that you pick up copies of all the albums on this Top 50 list. In case you missed the previous entries, here once again are links to #50-41 and #40-31. We’re continuing to chug along here, and I’m now pleased to present the next segment, #30-21! Okay, we’ve made it to Day 2 of this countdown. In case you missed the first set of 10 albums, aka #50-41, you can click here to bring yourself up to speed. The collection of records you’ll find below has a little something for everybody, I’d say. Well okay, maybe not EVERYBODY. But there’s some great synth pop, some punk rock, some electronica, some hip hop, and a little bit of experimental whatnot in there for good measure. If there’s a theme to be pulled from this portion of the countdown, it’s that change is inevitable, and can often turn out for the best. Anyways, let’s just get right into it. 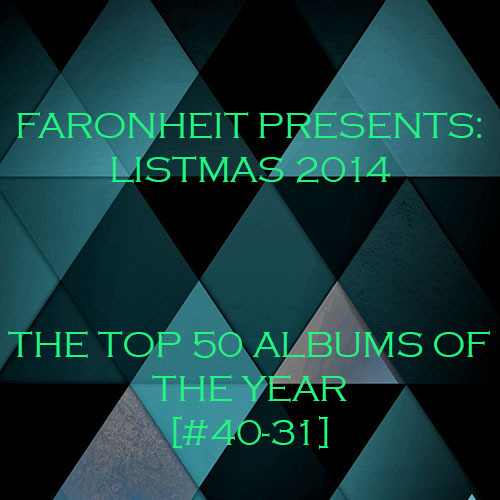 Here’s the Top 50 Albums of 2014: #40-31! Welcome, dear reader, to the official kick off of Listmas 2014! For the uninformed, Listmas is the grand tradition here on the good ‘ol site that celebrates the end of the year with a series of ranked lists. It’s not really a new or novel idea, and in fact pretty much every site that covers music releases their own lists, though I suppose very few put it all together under one broad label like this. Yet the word has also become part of the jargon people use to talk about this list-making season every year. Anyways, it’s my sincere hope that you’ll keep checking back and reading the site over the next couple of weeks while the slow roll out of Listmas takes place. We’re starting this week with the Top 50 Songs of 2014 countdown, and following that up next week with the Top 50 Albums of 2014 countdown. There are currently designs for another extra list or two leading up to Christmas and the site’s annual holiday break, but I won’t go into detail on those yet because there’s still a good chance they might never be written or published. The last couple of years this endeavor has become increasingly difficult to put together, and resulted in delays that pushed a list or two past the holidays. So let’s keep our fingers crossed that everything gets done in a prompt and concise fashion this year. Today we begin the journey of counting down the Top 50 Songs of 2014. Before we launch into this, a couple of quick notes. This list will be parsed out at the rate of 10 songs per post, ideally kicking off on Monday and ending on Friday. Along with the artist and song title, I’m pleased to provide different ways for you to hear each of the songs on this list. Some will be available for free download, but most will be streams through Soundcloud, YouTube or Spotify. The hope is to make all of this music as universally accessible as possible so you can hear everything should you so choose. Once the list is complete, I’ll include a link to a full playlist on Spotify where you can hear almost everything, as a few artists on this list don’t have or refuse to use Spotify. In regards to what you can expect, I’d say don’t make any assumptions and mentally prepare yourself to be outraged at some point. You’re not going to love every song, and the picks range from the very obscure to the super mainstream, even in the Top 10. No artist is featured more than once, though that rule technically doesn’t apply to collaborations or featured vocal spots. The goal is to spread the love as widely as possible, so hopefully that comes across in the end. 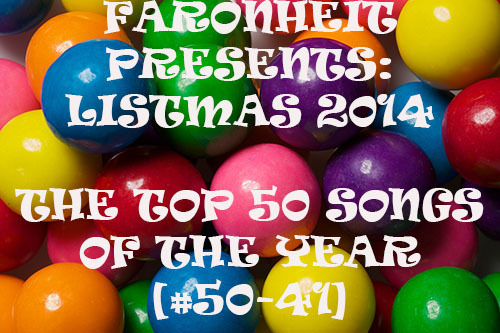 So without further ado, please join me past the jump for Faronheit’s Top 50 Songs of 2014: #50-41!